There’s plenty to see further afield, but don’t be surprised if you spend a good chunk of your coastal vacation with your face pressed up against the glass of this oceanfront home’s generous west windows! Located in serene, secluded Arch Cape, Falcon Getaway is a well-maintained two-bedroom, two-bathroom haven that gazes directly out onto a dramatic ocean scene. The emphasis here is on cozy comforts and fantastic views in an oh-so-private private setting. A covered carport and small front lawn lead up to the front entrance, which is set back on the property to maximize views. You’ll catch sight of great ocean vistas in the home’s living room, which features a real fireplace, cozy sofa and a small flat-screen television. Views keep coming from the small kitchen and dining area, so let the ocean keep you company as you enjoy an evening meal in. The fresh, unfettered master bedroom offers a king bed and more ocean views, plus a master bathroom with tub. A simple second bedroom offers a double/twin bunk bed, while an airbed is also on hand to accommodate extra guests. There’s also a second bathroom with shower. A large deck on the home’s south side offers a prime perch for surveying panoramas of the ocean and Castle Rock. The deck leads down into a bluff backyard, where a green lawn and hedges abut the sandy shoreline. Walk out to the edge and sneak a peek at the water from a small viewpoint. The endless views stretching south to north will captivate you. Want to get down on the shoreline? Take the nearby beach access, located right next to Falcon Getaway. This private Arch Cape retreat offers dramatic seascapes far from the coastal crowds and just as close as you could please to that wonderful Pacific Ocean. Drop your bags, take a breath and let enchantment do the rest– in these parts, there’s definitely something magical in the air. 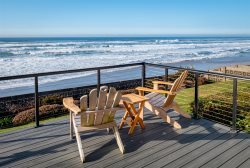 Cannon Beach Vacation Rentals offers these nearby homes: Schilling Beach House, Drift On Inn , and Pearl of the Cape. Always great service. Very customer oriented.